On my Pinterest account I have a board titled Logo design inspiration. It’s there to inspire me when I’m designing logos for clients, and used as a place to store references. Pinterest is fantastic for that purpose – I used to have scrapbooks full of pictures I had cut out of magazines, to use for inspiration, but the ability to store everything online is fantastic. For any business that has wonderful pictures of their products I really recommend it. Pinterest users regularly share photos they like, any from your site will be linked back to it – making it good for SEO! What’s not to like about this logo? It’s Japanese as a Westerner sees Japan – simple, clean and highly effective. If you were unable to read, but knew what sushi was, you’d know what was being sold (interesting Venn diagram that one – who lives in that intersection?). It’s beautiful, just what the word graphic was made to describe. Once again, the logo makes what’s being sold obvious, but it’s done with such style! The ‘C’ looks Celtic, as if it was from an illuminated manuscript. There’s almost a look of worry in the fish’s eye as it is irresistibly drawn to the hook. If I saw this hung on a sign above a shop on a street I was walking along, I too would be irresistibly drawn to look inside. This is by a chap called Emanuele Tobacco and it’s particularly clever. 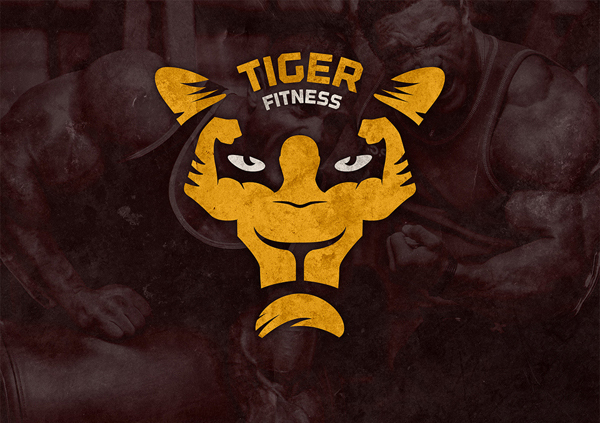 On first glance it’s a tiger, which is an appropriately fierce and macho image for a gym, but on closer inspection one can see the tiger’s face is made up of a muscular Charles Atlas type physique. I love how the tiger’s nose works as the man’s pectoral muscles. I’m more a sand kicked in the face person, but this logo could tempt the macho man out of me and into that gym!